On Trayvon Martin Memorial Day, Mrs. Somerville began morning meeting by asking students to greet each other with peace, love, and respect. 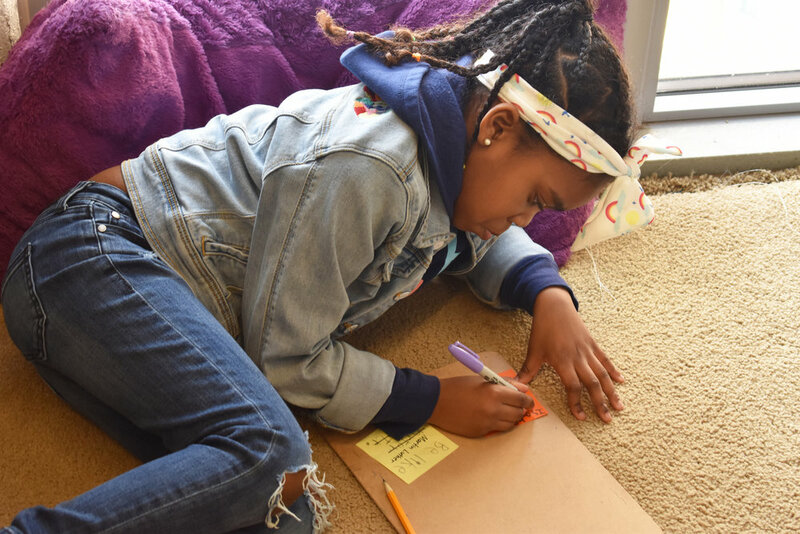 She then asked students what they remembered from their prior discussion about what happened to Trayvon Martin and whether they had been having conversations about it at home. The man hurt Trayvon Martin because of what he looked like and he did not get in trouble. This made many people sad and angry. So a group of three women, Alicia Garza, Patrisse Cullors, and Opal Tometi, decided to stand up to say it is not OK to judge someone just because of what they wear and what they looked like. They encouraged many people to speak up too, and now we have the Black Lives Matter Movement. After reading the story, Mrs. Somerville asked students to think about what they heard and how it related to the Black Lives Matter principles they’ve been learning about, and if they had any questions about what they heard. Think about what it feels to like to have someone judge you by what they look like or what they’re wearing — or a time that you judged someone. What did that feel like? Were you necessarily right about what you thought? If you saw someone being treated unfairly, what are some of the things you could do? One student shared, “I said that I would stand up because it wouldn’t feel right to have people getting hurt or judged by what they look like.” Mrs. Somerville tied it back to the book they read last week by asking, “Would you be their One” and then encouraging students to ask their parents to watch the video of the book with them. In Ms. Bolden’s Kindergarten “Pandas” classroom, a student led a discussion to try to understand how Trayvon Martin was seen as a danger. After examining a photograph of Trayvon in his hoodie, Pandas noticed his hoodie and his skin color. The students looked closely at their fellow classmates wearing hoodies in honor of Trayvon’s birthday, and determined that no one looked menacing because of their clothing. They decided that it must have been Trayvon’s skin color that made him appear dangerous to George Zimmerman. Each student touched and described their own skin, and they reached the conclusion below. The school is participating in Black Lives Matter at School Week of Action. More photos and video from Inspired Teaching Demonstration PCS.